LOUISVILLE, Ky. – Fifty student-athletes from across the country have been selected to the “Watch List” for the 2019 Schutt Sports / NFCA Division II National Player of the Year award. 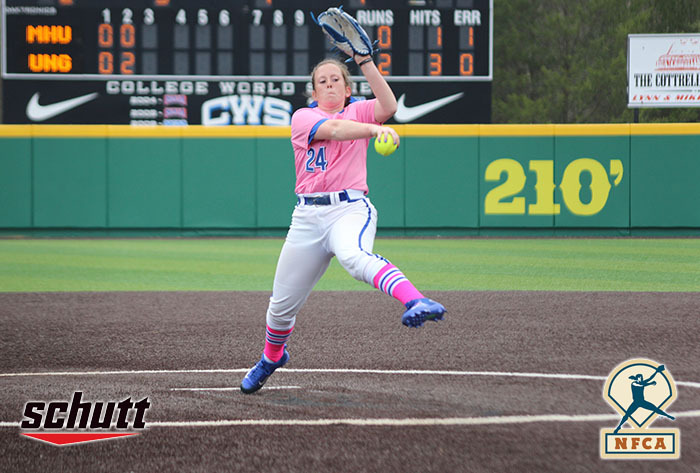 Headlining the list are 29 returning NFCA All-Americans, including 2019 Schutt Sports / NFCA Player of the Year Kylee Smith (pictured - courtesy of UNG Athletics) of North Georgia. Eight return from the first team, 10 are from the second and 10 were third teamers. In all, the group consists of 19 seniors, 21 juniors and 10 sophomores, representing 44 programs from 21 different conferences. Freshmen are not eligible for the “Watch List”, but can be considered for the Player of the Year award once they have competed at the collegiate level. Six programs garnered multiple candidates with Chico State, Tarleton State University, UC San Diego, University of Alabama in Huntsville, University of North Georgia and Winona State University all earning two nods. The California Collegiate Athletic Association led the way with five honorees. The Peach Belt Conference, Rocky Mountain Athletic Conference and Lone Star Conference paced the way with four, while the Northern Sun Intercollegiate Conference, Great Lakes Valley Conference, Gulf South Conference, Sunshine State Conference and Great Midwest Athletic Conference each had three selections. The Top 25 finalists for the 2019 Schutt Sports / NFCA Division II National Player of the Year award will be announced on April 25. A student-athlete does not have to be on the watch list to be considered for the Top 25. The top 10 finalists will be announced on May 14 and the winner will be recognized on May 30 following the conclusion of the 2019 season. The previous honorees of the award are Courtney Poole, North Georgia (2015), Lyndsay Butler, Wayne State University (2016), Coley Ries, Minnesota State (2017) and Smith. Behind the collaboration between the NFCA and the NCAA Division II Head Coaches Committee, and the generosity of Schutt Sports, the award was created in 2015 to honor the outstanding athletic achievement among softball student-athletes throughout Division II.